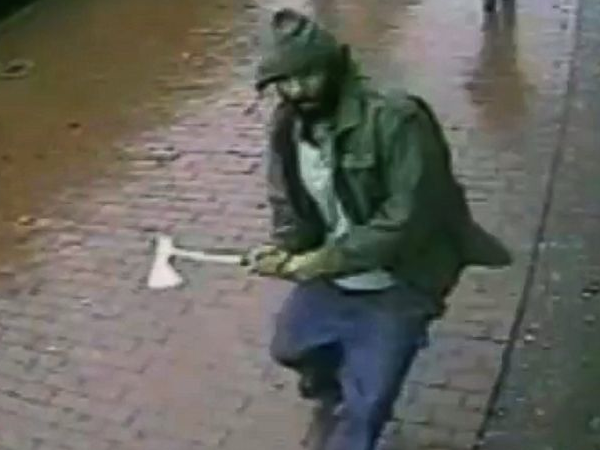 The NYPD revealed in a press conference on Friday that Zale Thompson, the hatchet-weilding lone Muslim terrorist who attempted to ax four police officers to death in a Queens, New York subway on Thursday had several prior arrests in Oxnard, California and was released. Thompson converted to Islam recently and praised Jihad over social media. His apparent Facebook profile picture is the image of a Muslim warrior and the background image is of an Islamic verse, presumably from the Qur’an. The Facebook page says he graduated from Columbia University’s Teacher’s College. The 32-year-old, who changed his name to Zaim Farouq Abdul-Malik after he converted to Islam two years ago, was able to cause injury to two police officers by axing the back of one officer’s head (who is now in critical condition) and cutting the forearm of another before being shot and killed by the other two officers who were also present at the time. If the Zionists and the Crusaders had never invaded and colonized the Islamic lands after WW1, then there would be no need for Jihad! Which is better, to sit around and do nothing, or to Jihad fisabeelallah! The goal of ISIS (or Islamic State) is to create an Islamic caliphate, a borderless kingdom where Islam rules.